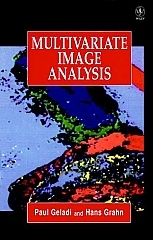 Multivariate Image Analysis (ISBN 978-0471930013) gives the reader a sound understanding of the importance of, and the principles behind, multivariate image analysis. The quantity of visual information encountered experimentally by scientists across a wide range of fields has grown dramatically in recent years. As a result, the importance of dealing with multivariate data (data obtained by measuring a number of different quantities simultaneously) present in images has become much more important, and the requirement for techniques which are able to manage and analyse these data has become crucial for the practising scientist in many diverse disciplines. The important concepts of residual visualization and local modelling are explained. Throughout, the power of the techniques discussed is demonstrated with the use of simple worked examples to illustrate the concepts, and more complex examples to indicate to the reader how a complete analysis would be carried out. The book is richly illustrated with colour images. Multivariate Image Analysis is of great interest to all those involved in the analysis of data contained in complex images. The techniques discussed are widely applicable, and are finding use in fields such as microscopy, satellite remote sensing, medical imaging, radiology, analytical chemistry, spectroscopy and astronomy.